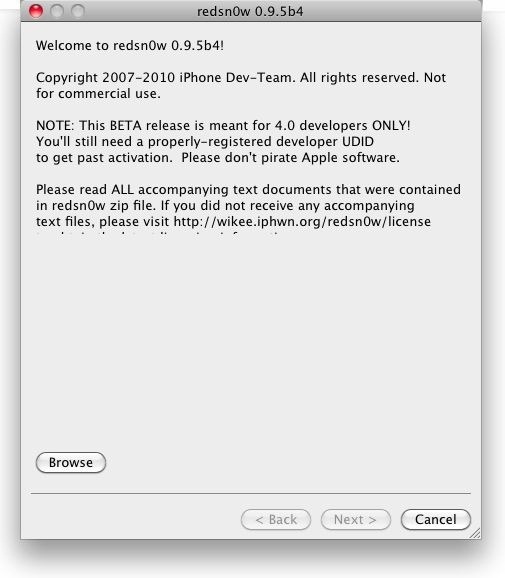 A new version of Redsn0w(redsnow) 0.9.5b4 has been released by iPhone dev team. It can be used to jailbreak iPhone OS 4.0 beta 4. It is meant for developers and should not be used by normal people. This is a beta release of redsn0w targeted at developers of jailbroken apps. It uses the same pwnage2 DFU-mode exploit that we’ve been using since the 2.x days. Nothing new is revealed to Apple, and it’s not applicable to the iPad. Don’t go near it if you use yellowsn0w, ultrasn0w, orblacksn0w. YOU SHOULD STAY CLEAR OF THIS BETA SOFTWARE IF YOU RELY ON A CARRIER UNLOCK. That’s because the beta redsn0w works only if your device has already been upgraded to the stock 4.0beta1/beta4 IPSW from Apple, which contains a baseband update. If you installed that IPSW, you’ve already lost the carrier unlock until the next planned release of ultrasn0w and blacksn0w.